"Not only did it make a fantastic sort of Thai-like salad, I can see this dish being quite versatile as well. It was very tasty hot and would be great over rice with some of the cooked-down marinade. It would also be amazing over a big bowl of crunchy greens. Just don't skip the toasted coconut as it really does make the dish." 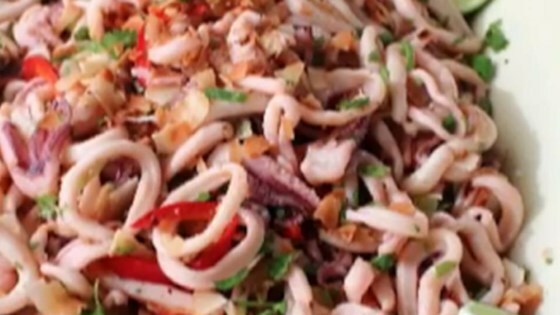 Combine calamari, serrano pepper, Fresno pepper, lime juice, 2 tablespoons green onion, coconut milk, fish sauce, rice wine vinegar, and palm sugar together in a large bowl. Cover the bowl with plastic wrap and refrigerate until flavors blend, 2 to 3 hours. Pour calamari mixture into a colander set over a sink or bowl and drain, about 5 minutes. Discard liquid. Heat oil in a large skillet over high heat until oil smokes. Cook and stir calamari mixture in hot oil until calamari turns white and firms, about 1 minute. Pour mixture into a large shallow serving bowl and cool to room temperature. Wrap and refrigerate until cold, about 1 hour. Toss calamari and any accumulated juices together in the bowl. Add coconut flakes, cilantro, remaining green onion, and lime juice; stir. This is very yummy. Lots of Flavor. Thanks Chef John! Quick to do and a refreshing way to start your meal. Goes great with a glass of wine. I just love how the flavor explodes in your mouth. You must try this!